(Bloomberg) -- The European Parliament’s two biggest political alliances trimmed losses in the assembly’s latest projection of election results in May, while the populist party of Italian Deputy Premier Matteo Salvini largely maintained a big gain. 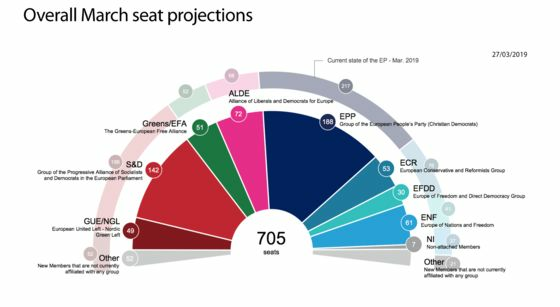 The outlook released on Friday in Brussels broadly reinforces forecasts on Feb. 18 and March 1 of the 705 seats to be held by national parties and their European Union umbrella groups in the EU Parliament after a May 23-26 ballot. The U.K., which is scheduled to leave the bloc beforehand, is excluded. The predictions signal a broader coalition of pro-EU political families will be needed to advance European legislation and other common projects during the forthcoming five-year term. That’s because the two largest factions, both traditional mainstream actors, will see their combined share of seats fall below 50 percent. The EU’s Christian Democrats will remain the No. 1 group in the European assembly with 188 seats, up from the previous projection of 181 and down from a current total of 217, according to the new forecasts. The Socialists are still seen as the No. 2 group with 142 seats, up from the last projection of 135 and down from 186 in the current EU Parliament. Salvini’s League is projected to have 27 members, down from 28 in the previous forecast and up from six currently. The number of seats that will be held by the right-wing group to which the League belongs -- the Europe of Nations and Freedom -- is projected to total 61, higher than 59 in the last survey and than 37 now. The latest gain for the ENF reflects a forecast that Marine Le Pen’s National Rally party, which also belongs to the faction, will have 21 seats, up from 19 in the previous poll and from 15 currently. A rival populist group in the EU assembly is called Europe of Freedom and Direct Democracy and includes the League’s ruling coalition partner at home, the Five Star Movement of Italy’s other deputy premier, Luigi Di Maio. The number of Five Star-affiliated EU lawmakers -- currently 14 -- is forecast to grow to 18, down from 21 in the previous projection, giving the faction a total of 30 seats compared with 41 at present. Europe’s Liberals continue to be seen as the No. 3 faction with 72 seats -- down from 75 in the last survey -- and as potential kingmakers in the formation of any pro-EU majority coalition. Their ranks could swell with the addition of French President Emmanuel Macron’s Republic on the Move party, which is forecast to have 22 members, unchanged from the previous projection. The biggest national party in the next EU Parliament is still forecast to be the German Christian Democrats allied to Chancellor Angela Merkel. They’re projected to have 33 members, down from 34 in the previous projection and currently.